From 6 May to 18 June 2015, Galerie m is featuring paintings and installations by Lee Ufan (b. 1936 in Kyongnam, Korea). The artist, who splits his time between France and Japan, is the author of numerous philosophical texts and is today well-known internationally. At the latest since a retrospective at New York’s Guggenheim Museum in 2011, Ufan is regarded as one of the world’s foremost contemporary artists. His ties with Bochum are diverse – he already had his first show at Galerie m in 1976; in addition to the works in the gallery, several of his sculptures are permanently installed in the gardens of Haus Weitmar and are on view at Situation Kunst. The current exhibition presents a concentrated installation of four pieces from Lee Ufan’s major work complexes: two sculptures from his series of three-dimensional works, for which Ufan chose the title “Relatum” in 1970, and two large-format paintings typical of his work since the early 2000s, in which the artist applies oil mixed with crushed stone pigments on the primed canvas in isolated brushstrokes. All of Ufan’s works juxtapose natural elements – boulders, stones, stone pigments – with unfinished industrial materials – steel plates, light bulbs, canvases. An important role is played by blank areas and empty space. The objects strike up intriguing dialogues with the space around them and with each other that go beyond the associations inherent in the individual works. Galerie m is showing a very early work from 1978 from the group “Relatum” alongside a more recent installation, from 2000. 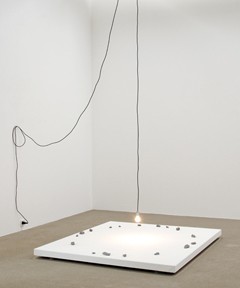 In “Relatum” from 1978 a light bulb hangs from a plain black cord over a white canvas that seems to float just above the ground. A circle of small stones are arranged in a circle around the cone of light. The installation “Relatum” from 2000 consists of a reddish boulder resting on a steel plate. In both works, natural elements and industrially produced material are left in their natural or raw manufactured state, without being artistically processed. Ufan limits his artistic act to selecting the items and composing them in a thought-provoking manner. These simple constellations are capable of summoning questions about existence, time and transience: lightness and heaviness, strength and balance, volatility and duration, dynamics and silence. The works of Lee Ufan put the contemplative viewer into an almost meditative state, which consists not least in a reflection of his own presence in the space and his relation to the works.